There’s nothing quite like a barbecue on a warm, sunny day to lift the spirits and it can be even more enjoyable on board a boat. When it comes to safety, there is not too much difference in terms of the safety aspects of having a barbecue on a boat or in your back garden, with just a few exceptions. You should invest in a proper marine barbecue which you can buy from most reputable boating stores. These are designed to be fitted securely onto a railing or pedestal on the boat so that they can’t be accidentally knocked over. You can also buy models that have additional safety features such as secure lids that can’t be blown off by the wind. The vast majority of marine barbecues will run off propane. If you’re fitting it yourself, make sure it’s located away from any machinery and that no propane can escape to the bilge or engine and also make sure it’s situated away from any enclosed spaces. NEVER attempt to cook on a barbecue inside the cabin. You should also ensure it’s not located in an area that will be used as an exit point should it get out of control. If you do intend to use a charcoal barbecue, buy self igniting charcoal as opposed to the charcoal where you need to use lighting fluid and make sure you have footwear on. If your barbecue is going to last for quite some time, you should prepare your food in advance and store it in the fridge before you need to take it out on deck. Place all meats and vegetables into separate waterproof, resealable bags and then these can all be placed in a cooler with ice and taken out onto the deck when it’s time to light the barbecue. Also, ensure that you have access to a wash bowl so that you can wash your hands in order that you don’t contaminate the food by touching cooked and uncooked meats before washing your hands. Although modern day secure marine barbecues make it possible for you to cook whilst on the move, if the water is rough or the wind is blowing a lot, it’s far better and safer to moor up along the water’s edge at a convenient spot away from the swell where possible. Make sure you have a fire extinguisher close at hand and know how to use it. Also, if you have guests who are not normally used to being on your boat, it’s wise to inform them of the whereabouts of any fire extinguishers or fire blankets and of the location of life jackets, just in case the worst was to happen. Some boats can also be quite cramped when it comes to space so make sure that the cook has sufficient space and that any kids and any pets are kept as far away as possible. Many adults will associate a barbecue with the opportunity to have a few beers too but if you’re the cook, try to abstain until all of the cooking is over and the barbecue has been turned off and covered over. Remember this is not like a garden barbecue – you’re on the water so you are more at risk from suffering accidents as the result of alcohol impairment. Finally, if the worst was to happen and a fire did break out, only use the fire extinguisher if it is safe to do so. If you’re in any doubt whatsoever, everybody should evacuate the boat and you should call out the fire brigade. 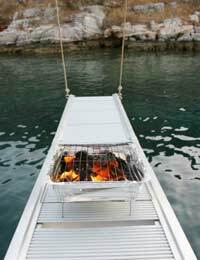 Following the advice above, a barbecue on a boat is as safe as it would be in your garden and often even more enjoyable.